Kitchari means mixture, usually of two grains. This is one kitchari recipe that is particularly nourishing and easy to digest. Please note the options below for some alternatives. For Pitta: leave out the mustard seed. Carefully pick over rice and dal to remove any stones. Wash each separately in at least 2 changes of water. Add the 6 cups of water to the rice and dal and cook covered until it becomes soft, about 20 minutes. While that is cooking, prepare any vegetables that suit your constitution. Cut them into smallish pieces. Add the vegetables to the cooked rice and dal mixture and cook 10 minutes longer. 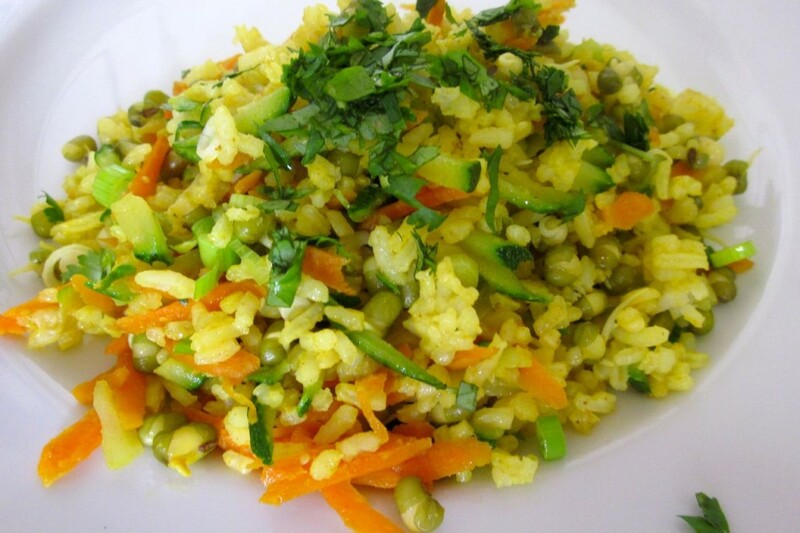 Caution: Kitchari mono-diet can lead to constipation if taken exclusively for several days, as it is low in fiber. To ensure proper elimination, the following may prove helpful if taken once a day, away from kitchari meals: psyllium husks or seeds with water OR oat bran OR prune juice.